Community-owned society behind the eco-friendly GlenWyvis distillery in Dingwall. GlenWyvis Distillery Ltd is an Industrial and Provident Society established to operate the community-owned GlenWyvis distillery in Dingwall. The society has over 3,000 shareholders, but is headed by distillery founder and managing director John McKenzie, and chairman David O’Connor. Duncan Tait, formerly distiller at Mortlach distillery in Speyside and early investor in GlenWyvis, joined the business as distillery manager in November 2017. Former army officer and helicopter pilot John McKenzie originally had the idea to open an eco-friendly, community-benefitting distillery on his farm in 2011, while flying private clients around Scotland. Naming the distillery after two lost distilleries in the area – Ben Wyvis and Glenskiach – McKenzie was granted planning permission in 2014, and the following year began the process of fundraising. GlenWyvis Distillery Ltd was incorporated in March 2015, while the first round of crowdfunding was launched in April 2016. Within 77 days the project had raised over £2.6 million from 2,200 people – £1.1m more than its target. Now with several hundred shareholders, GlenWyvis Distillery Ltd transitioned into an Industrial and Provident Society (IPS) – a co-operative and community society. Construction of GlenWyvis distillery began in January 2017, and was completed by November. Its official opening took place on 30 November, and the distillery is currently awaiting commissioning. A second round of fundraising was launched in August 2017 to raise £750,000 to fund the installation of a gin still and recruitment of a sales team. 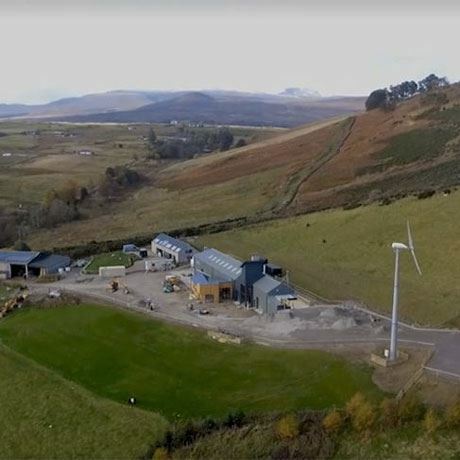 Scotland’s first community-owned distillery is also 100% powered by renewable energy. Silent 19th-century malt distillery near Dingwall once known as Ben Wyvis.